1987? That’s a long time ago, and remains only in the dim recesses … etc. etc. (I had to look up dates and plays online to be sure of my own history). That was the year I last went to Chicago, primarily to assist in the borning of the American Alliance for Theatre and Education. I now remember that while there I went to see the Robert Falls production of Road, by Jim Cartwright, with the Remains Theatre Ensemble … about the desperation of England’s working classes under Margaret Thatcher. But I remember little else of it, other than it was a “promenade” play, in which the audience followed the players around in the large warehouse setting, and that it affected me deeply. 1987 was also the year I made my first visit to the Steppenwolf Theatre, then only 13 years old (the theatre, not me). It was still in a 200+ seat hole-in-the-wall on N. Halsted, but already engaged in cementing its global reputation. The play was Wally Shawn’s Aunt Dan and Lemon. Steppenwolf is of course now a pilgrimage for any Chicago-bound theatre addict. Plays developed there include Detroit, August: Osage County, Superior Donuts, Picasso at the Lapin Agile, The Grapes of Wrath, True West, and so many more. And having just completed the Beverly role in Live Arts’ production of August…, I was not about to miss a Steppenwolf visit. So this past August, off I went on the CTA, playing hooky –TWICE—from my Dramatists’ Guild sessions … actually THREE times, counting my “Second City” adventure (See September 13 posting). What the heck: They were spending an awful lot of time on Steppenwolf and Second City history and philosophy anyway. In view of how much time has passed, I won’t spend any detailed time on the plays themselves. But Steppenwolf itself has obviously come up in the world since 1987. They send plays to New York, garner many prizes and awards, and since 1991 they now inhabit an impressive concrete building housing two stages. More recently they’ve taken over a neighboring parking garage for a third stage. four-character play. It’s Americans in Paris, so how can you go wrong? Like all good drama, neither circumstances nor characters are what they seem, and to say the least, the two main characters were … complicated. There were plenty of laughs, as well as the required ever-present sense of danger in the form of a kitchen knife. 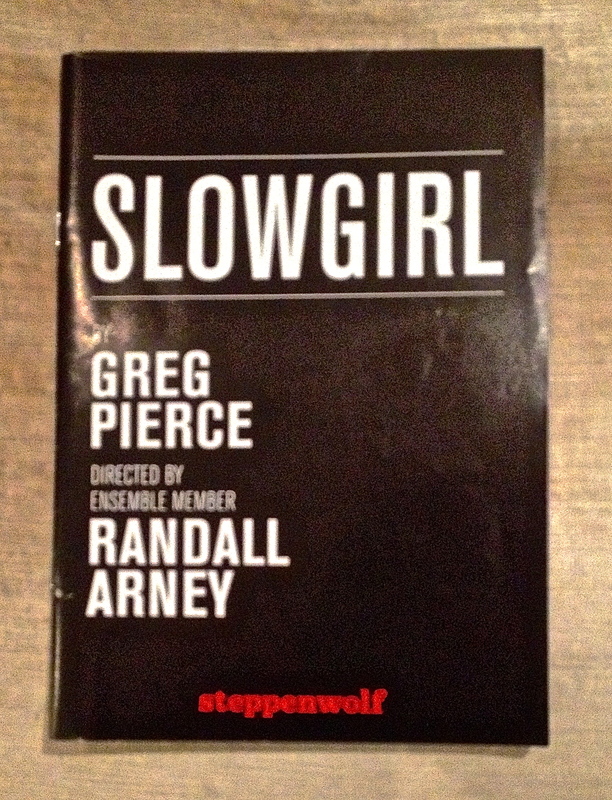 The second play, Slowgirl, by New York playwright Greg Pierce, was in the much smaller upstairs theatre, set up in an alley configuration – a beautifully designed Costa Rican jungle camp. It featured long-time company member and Remains Theatre Ensemble founder William Petersen (yes, the CSI Dr. Gil Grissom guy) as a lawyer with a past, visited in his hideaway by his teenage niece, in a legal jam of her own. By any standard, it’s a little play, only ninety minutes and two characters. Each is a self-imposed outcast, with hard lessons to be learned before any social reentry might be achieved. 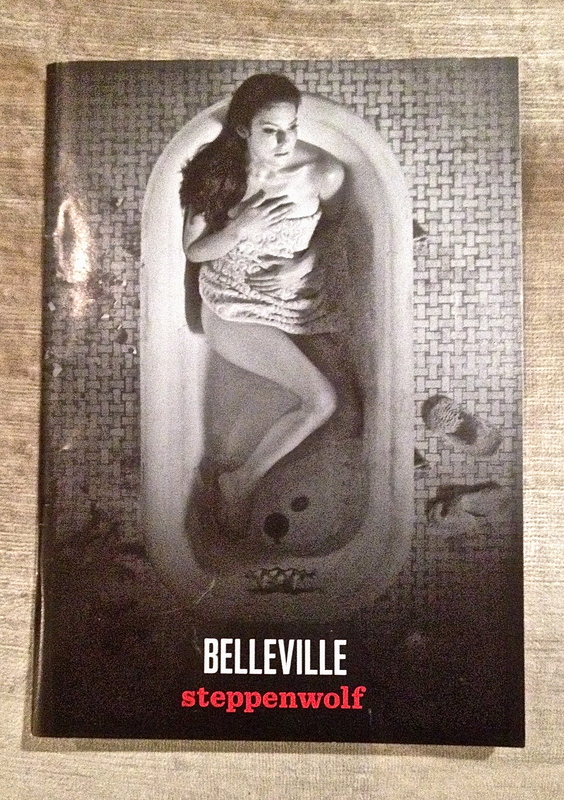 The play is admirably charged with secrets and tensions. … All well worth the trip! P.S. My good wife and favorite editor took issue with my use of the expression “suffice to say” two paragraphs back, saying the correct expression is “suffice it to say.” So we looked it up, only to find that both are right … or wrong. If you want to have some fun with a bunch of “correct” linguists, check this out! This entry was posted in Theatre and tagged American Alliance for Theatre and Education, Amy Herzog, Aunt Dan and Lemon, Belleville, CSI, Dramatists Guild, Greg Pierce, Jim Cartwright, Remains Theatre Ensemble, Road, Slow Girl, Wallace Shawn, William Petersen, Yale Rep. Bookmark the permalink.